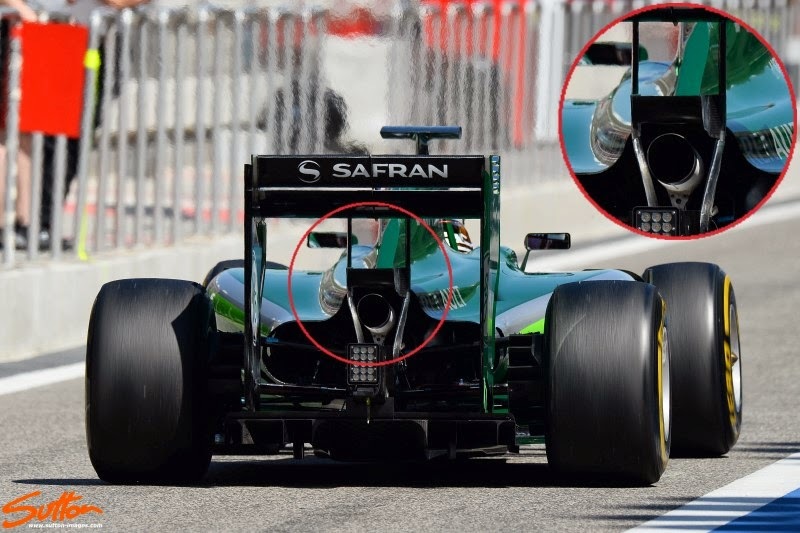 The changes that now prohibit the use of a Beam Wing have led to teams trying different solutions in order to retain the same or similar level of structural integrity, whilst trying to mitigate the aerodynamic effects. Caterham arrived in Melbourne with a new configuration and ran it throughout the weekend, the older specification utilised two pylons mounted either side of the crash structure and widened to take into account the exhaust, then terminated at roughly 200mm apart at the underside of the mainplane. The new arrangement (below) still comprises of two elements emanating from the top of the crash structure but these now bellow out to surround the exhaust before converging above it to form a singular pylon that meets centrally with the underside of the rear wing. In terms of structural integrity I'd suggest that both options offer similar performance with the new iterations a little bulkier. The aerodynamic implication however is that with only the centralised pylon (inverted Y-Lon) the interaction with the rear wing's mainplane is minimized increasing it's performance. You'll also note that the Y100 Winglet / Monkey Seat has been redesigned with the new version featuring no endplates, whilst it's mounted from the pylon on a swan neck support similar to the one used by the team in 2013.